1974 Henri 6 ft 10.5"
Foam blank, 1/8'' redwood stringer, laminated pigment, r/h legrope plug. The fin base has been badly damaged. HENRI - black block script at sweet spot along the stringer. 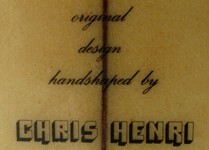 original design handshaped by CHRIS HENRI - black script across stringer, image below. Deck: 6'11'' x 19 1/2'' (above) and C.H. COUNTRY VIBE (below) - pencil along the stringer. Deck: Clear with green pigment laminated rail lap, 2'' at the nose and reducing towards the tail. Dimensions and photographs April 2008. Item submitted by Jackson Mahoney, Shoalhaven Heads, NSW. There is severve damage to the finbase and the bottom has many depressions and some areas of delamination and foam shrinkage. The tips of the nose and tail are damaged. The board has a massive repair across the deck above the fin, the cause of such severe damage unlikely to be in the surf. 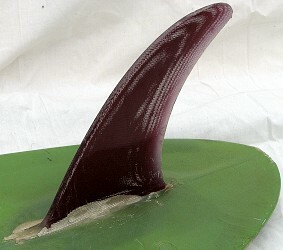 A stock rounded pintail of the mid 1970's, although in this case possibly a bit more gunnier at 6ft 11'' than most of the Curl Curl shop's orders. Hence the markings: "Country Vibe" which in this case probably refered to the point breaks of northern NSW.